I have felt an increasing urgency since I wrote about my encounter with “Jim” last month, to help our women grasp the importance of knowing God and knowing His truth for themselves, and helping them bring that truth revealed through Jesus to other women who are caught in the deception of our generation. Praise God women are responding and The Butterfly Effect continues to spread as women leave our workshops transformed, equipped and empowered by the Holy Spirit. I was privileged to lead two workshops in Orlando this month where we experienced a powerful out pouring of the Holy Spirit transforming and empowering women in both workshops. My executive assistant Angie also stepped out from behind her computer to lead her first workshop in New York this weekend where God did amazing things setting women free. 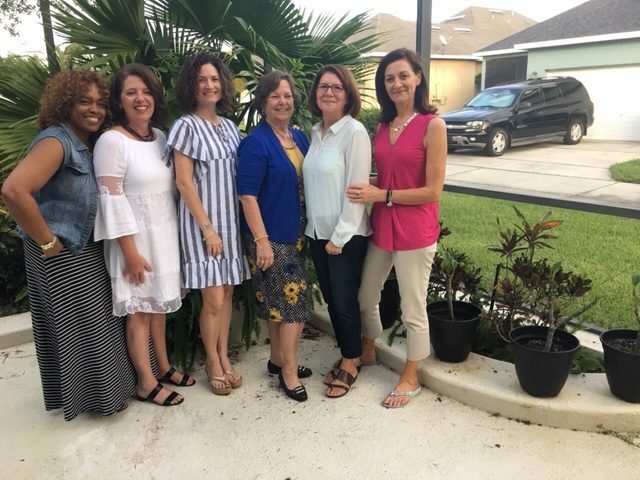 God has been increasing our S. Florida jail ministry as Tanya began teaching LUV 5 days a week in a Jail pod for 60 women, and began ministry in a second jail in Sebring, S. Florida for 30 women, many behind bars. In Brazil Marli led LUV workshops to equip Brazilian missionaries to Brazil, Africa and India. Other Butterfly leaders have shared testimonies of leading women to freedom in Christ in Moldova, Poland, India, South East Asia, and North America. At the beginning of October I had the joy of Commissioning a group of Butterflies who have faithfully completed their eighth LUV “Transform & Multiply” workshop. In 2015 these women, though long time believers in ministry, yielded to God’s call and the 3 ½ year process of being transformed, equipped and empowered, to reach women. One of the women confessed “3 years ago I loved the idea of ministry more than I loved the women.” The Holy Spirit has transformed these “ministry women” into women who passionately love God, seek His heart and have found freedom to worship Him unashamedly in Spirit and in truth. He has healed them and transformed them into women who have greater joy, discernment, compassion, freedom and humility to minister to other women with His heart of love. One sweet butterfly a believer for 30+ years summed up what every woman was trying to express about their experience; like Job I can say “I heard of You with the hearing of the ear, but now I SEE YOU.”! I cry thinking how 3 ½ years ago I found people here who long to worship in Spirit and truth, and to be free in worship. I had gone through a very traumatic experience and it left me very wounded. I came through the door and because I was so wounded I sat here numb for quite a while. I had loved the Lord and I loved His word, so during the process of the word washing over me here I heard how deeply the Lord loved me and how my circumstances had nothing to do with His love for me or what He thought of me. And through the teaching and the word, the Lord began to transform me. I am so grateful that He was able to restore and redeem me and use it to tell other women that there is nothing that God cannot redeem. I was so grateful to have freedom in a safe place, to speak what God was doing was life giving. I am so grateful for this ministry because I sat in church for a long time and there was no one there I felt I could go to. But when I came here and the word began to come alive in me, and these women began to pray for me, deep prayers I was so grateful for the honest, transparency and for God doing a work. It has been supernatural. It has been nothing plain and ordinary. Every workshop including today, God has met us supernaturally through His word with revelation, healing, encouragement and transformation. Especially today, in this last workshop He has been drawing us deeper and closer. Just when you think you can’t learn any more or come any closer He opens His word and reveals His heart once more. It has brought me such a freedom to share with other women. Now I lead a butterfly group. Sometimes in our group we have 5 -6 women. Sometimes just 2 or 3 but last week with just 4 of us we began to worship and the Holy Spirit took over and one of our group saw miracles happen for her. I’ve seen a bigger picture through LUV. I now see God’s view and I see it in others. When I came here for Workshop One I was very dry inside. I came from a Christian background, but I was so broken and so lost. I came to the Workshop because I was so thirsty and so hungry and I had carried so many burdens and hurts for so long. God really opened my heart and He taught me forgiveness is all about love and that no matter what, He loves you, you are precious in His sight and He can use you. He taught me to love His word, to believe in Him and He gave me back my joy. When I came here to the LUV workshops I left so full of His joy again and a desire to serve Him and be used by Him in any way He could use me. He was pouring so much into my life by praying with me through the women and learning and growing in the word. Now it’s time to go out and show others how to know Him, to show His love and that He will draw you in and won’t let you go. He will stay after you. It has been such a blessing to me. I can never thank Him enough for all He has done for me here. God brought this ministry into my life at a time that I deeply needed it. When I should have been feeling excited about a new ministry opportunity I was feeling confusion and darkness. I was not OK. Now I know it was God bringing me into deeper understanding of His word and of freedom in Him. It is the blessing of God that He allowed me to be in this place at this time. I’m not the same person that I was in Workshop One as who I am now, in Christ. He brought me to confession, that was really important to growth in Him. I had so much knowledge of the word, which is a blessing, but on day one of the workshop He whispered “you don’t love my word.” I said “You’re right”. Now I understand “taste and See that the Lord is good.” The words in the first workshop burned into me “send out Your light and Your truth, let them lead me to Your holy hill” Ps 43:3. I know my heart of stone but now I have a heart of flesh which is real in me. I understand more about transformation and becoming who He created me to be and really understanding that true worshippers worship Him in Spirit and in Truth. My journey is not Job’s journey but like Job I can say “I heard of You with the hearing of the ear, but now I see You!” and it is so sweet. Now I feel that 4 years here isn’t enough. My heart is overflowing. I am overflowing with questions – who can I tell? What word do You have for me to share at this moment? I’ve been a believer for 45 years but now I realize I didn’t know or understand my salvation. I’ve grown in it from glory to glory in these last 3 years. I came here 3 ½ years ago thinking I was going to have tools or resources to do ministry. I had done ladies ministry for more than a decade. When I came here I was out of ministry going through a very painful season. My world was being turned upside down. I had prayed that He would bring me through it and not let me be the same woman. I had barely begun to understand how my world was going to be changed. God had allowed a complete stripping of everything in my life so I came in here with a lot of pain but still with an expectation of being used. I didn’t know that in order to use me He had to completely transform me. When I came here I had more of a love for the “idea” of ministry than I did for the women. Now ministry is not on my mind. He has completely transformed my mind and my heart. I had so much head knowledge of God’s word but I didn’t believe it deep in my heart. Now I believe it so deep inside of me. It’s indescribable. I don’t think any of us can do it justice to describe what God has done within the four walls of this room. I’m so grateful and so excited about what God has ahead for us. Thank you dear partner for praying for these women as God calls them to reach women in many different spheres. God is doing amazing things in our lives as we meet together during these workshops. Your prayers are not in vain. I value every prayer to cover our workshops. I need them. Our women need them. We cannot reach the lost and broken hearted outside the church unless women in the church are healed, set free and empowered to reach women with the heart of God. This week I appreciate your prayers as I fly to N. Carolina for vision casting and follow up meetings with our NC butterflies. I will return the following week to lead Workshop 6 in Orlando for some of our US and International butterflies on November 9th. I look forward to sharing more powerful testimonies of transformed lives in recent workshops, later this week.